U.S. Deputy Assistant secretary for Cyber and International Communications and Information Policy Robert Strayer holds a news briefing at the Mobile World Congress in Barcelona, Spain, Feb. 26, 2019. 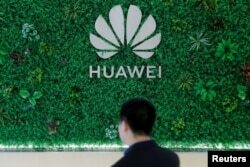 WASHINGTON — A senior official in the U.S. Department of State said Wednesday the security concerns the government has raised related to Chinese telecommunications firms Huawei and ZTE extend to all companies headquartered in China, saying they are effectively "under direction" of the Chinese Communist Party. "It's very important to distinguish how Western democracies operate relative to their private sector companies and vendors, and how the Chinese government operates with its companies," Ambassador Robert L. Strayer, deputy assistant secretary for Cyber and International Communications and Information Policy, said during a conference call with reporters. Chinese companies don't have the ability to mount a legal challenge to directives from the government, he said. "They don't have the ability to go to court," he said. "They're basically under direction — what we call extra-judicial command — of the Communist Party of China ... to take actions, when requested by the government. There's not the same rule of law that we consider a part of our daily lives and all of our business dealings in Western democracies." FILE PHOTO: Logo of Huawei is seen at its showroom in Shenzhen, Guangdong province, China, March 29, 2019. Strayer has been the point person in the Trump administration's effort to block Chinese firms, and Huawei in particular, from participating in the global rollout of 5G mobile communications technology, insisting that Chinese law requires the companies to cooperate with Beijing's intelligence services. Strayer and other officials have warned that Chinese telecommunications firms could give Beijing intelligence services secret "back-door" access to sensitive communications networks, or that in a crisis, they could disrupt communications on command. His comments were among the administration's most comprehensive justification for trying to block Huawei's entry into the U.S. and European 5G markets. Ren Zhengfei, Huawei's 74-year-old founder and president, recently told the BBC that to do so would be economic suicide. "Our sales revenues are now hundreds of billions of dollars," he said. "We are not going to risk the disgust of our country and our customers all over the world because of something like that. We will lose all our business. I'm not going to take that risk." Samm Sacks, cybersecurity policy and China digital economy fellow at the New America Foundation, said, "The reality is the Communist Party of China uses the law selectively as an instrument as it sees fit." "What does worry me is this hypothetical situation of what Huawei would be employed to do by the Chinese government," she told VOA. "I think we have to look at what Huawei as a commercial company needing to succeed in global markets have in its interest. And I'd say right now, it's not in its interests to use those vulnerabilities. But that could change in another scenario." The U.S. effort so far has achieved only limited success in its efforts to get allies to impose blanket restrictions on the use of equipment made by Huawei and ZTE in cutting edge, high-speed, next-generation infrastructure. However, Strayer said that as countries around the world begin looking closely at the risks, he believes an eventual ban on the two firms' products is inevitable. 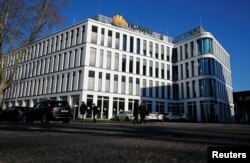 General view of the German headquarters of China's telecommunications giant Huawei Technologies in Duesseldorf, Germany, Feb. 18, 2019. The proposed German standards would require that telecommunications systems "be sourced from trustworthy suppliers whose compliance with national security regulations and provisions for the secrecy of telecommunications and for data protection is assured." Given the legal requirement that Chinese companies assist the intelligence services —and keep that assistance secret — "It's hard to see how Chinese technology would meet that standard for protection of data," he said. "We have encouraged countries to adopt risk-based security frameworks," Strayer said. "And we think that a rigorous application of those frameworks, if they include supply chain security risk and the consideration of the relationship between a 5G vendor and their government, will lead, inevitably, to the banning of Huawei and ZTE." "We think it's very important that countries deploying 5G networks consider the relationship between a foreign government, where a vendor is headquartered, and the companies themselves and that country," he said. "When we look at the Chinese laws, relative to intelligence and national security, those allow the Chinese government to direct the actions of companies for their national interest of China, as well as require that companies to maintain secrecy, about the actions they've taken at the direction of the Chinese Communist Party." "The Chinese government, through state-owned banks and other sources, has provided in some cases zero percent interest, 20-year loan offers, which are not commercially reasonable," he said. "That kind of unfair playing field is not one that Western technology should have to compete with. It should be a level playing field for technology vendors." In addition, he said, government-supported "cross subsidization" allows Chinese firms another avenue by which they can undercut the prices of Western firms. "They can get large profits on what they sell into the Chinese market, which they largely have under their control through the government, and then use those subsidies to then offer lower prices in our markets in the West."